The success of Hamilton has made acquiring tickets to the hit Broadway show nigh impossible, which has resulted in despair for Alexander Hamilton aficionados, fans of musicals, as well as anyone who just wants to know what all this Hamilton talk is about. Creator Lin-Manuel Miranda has sought to alleviate some of that desperation with a lottery, while NBC is pondering just how to harness its popularity. And that upcoming national tour should address some of the overwhelming demand when it kicks off in San Francisco next year. But since even the possibly open-ended run in Chicago is still six long months away, the cast got an unofficial head start with a performance at the White House on Monday. President Barack Obama invited the Hamilton cast for a day-long celebration of the arts on March 14, which saw the performers lead Q&A sessions and workshops with students at the White House. 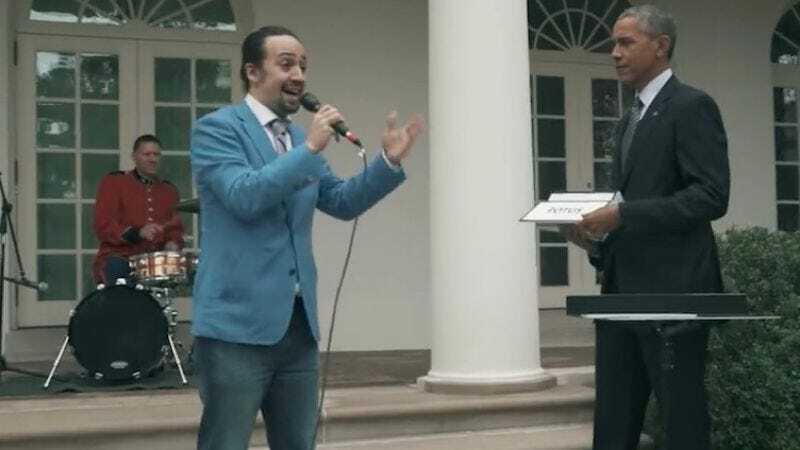 Miranda was joined by fellow cast members Phillipa Soo, Daveed Diggs and Christopher Jackson in a performance following an introduction from the President, who noted that Miranda first performed a Hamilton-inspired rap at the White House in 2009. Later, Miranda took to the Rose Garden with President Obama, who held up cue cards to prompt the Grammy winner’s freestyle raps about the Constitution and Obamacare. The President also seized the opportunity to suggest a Congress-inspired musical to Miranda, though he stopped short of making it an executive order.